Award winning Irish programme ‘Roy’ returns to RTÉ Two for a second series on Friday evening at 5.30pm. The young people’s programme, which combines hand-drawn animation with real-world drama, was made by Dublin based animators JAM Media in association with RTÉ. The series includes Irish acting talent Simon Delaney (Bachelor’s Walk), Cathy Belton (The Clinic) and Martha Byrne as Roy’s family as well as young Irish actor Scott Graham (Pentecost, The Master Plan) just back from the Oscars, as the voice of the animated character Roy. Roy is the world’s first cartoon boy, aged 11 he lives in the real world. Born into an ordinary family in Ballyfermot, Roy is an every-day kid living in an every-day house on an every-day street. Inside he feels just like an ordinary kid sharing the same hopes, aspirations, friendships and fallouts as any kid his age. The trouble is he’s animated. The first show of the brand new series ‘Food, Fat, Fit’, focuses on the theme of body issues, as Roy is desperate to make it onto the football team to play in the final, but is told he is not fit enough. The class bully persuades Roy that it’s because he is too fat, thus he embarks on a fierce and dangerous regime of exercise and dodgy diets with some serious adverse effects. But there’s a happy ending when Roy gets back on the healthy road. 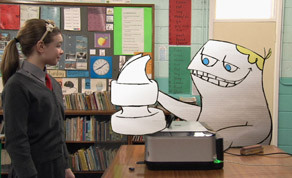 Based on the short film Badly Drawn Roy which was filmed under the Irish Film Board Frameworks scheme, ROY is produced by JAM Media in association with RTÉ Young Peoples Programming and commissioned by CBBC.